Cecil Lancelot Howard, known to his friends and family as Lance, was born in Fremantle, Western Australia, on 12 January 1913, the son of Henry and Helen Howard. He worked as a commercial traveller before the war. He joined the RAAF in 1940 and was initially selected for pilot training. Eventually he was remustered as a navigator. He arrived in the UK in late 1941 and was posted to 14 OTU at RAF Cottesmore. He was posted to 49 Squadron in May 1942, where he spent some time in further training in the Conversion Unit. By late 1942, he was flying as the regular navigator in Bill Townsend’s crew and went on to complete 25 operations by March 1943. By then he had been recommended for a commission, although it was not confirmed until after he had joined 617 Squadron. On the night of the Dams Raid, Howard was apprehensive as Townsend coaxed AJ-O into the air. “I had visions of the bumpy (grass) take-causing the lights under the fuselage to be shaken off so that instead of being 60ft above the ground we would finish up 60ft below it,’ he later remembered. They made it into the air, however, and set course for Germany. It was a clear night with a full moon and we flew at 60 to 100 feet to keep under German radar. On the way in we received a radio message to attack the Ennepe dam, which indicated that the main target, the Möhne, had been breached. This we saw for ourselves shortly afterwards as we used this for a turning point on the way to the Ennepe. It was an horrific picture with a great stream of water bursting down the valley from the breach in the dam wall. We attacked the Ennepe at sixty feet height and a speed of 240 miles per hour. There were no defences and the bomb was accurate. But no breach was observed and it was obvious that two or more bombs would be needed. Unfortunately there were no other aircraft … So back we screamed flat out to the Möhne with the engines at maximum revs and thence up to the north Dutch coast where we were sent on our way by a large flak gun, and then over the North Sea to Scampton. We had another encounter with flak and searchlights on the way in, and all in all one wonders how we survived flying low-level and dodging high tension cables and trees. We were the last crew back. Howard’s last two operations in the whole war were the squadron’s attacks on Italian targets in July. In September, three days after he had represented the squadron at David Maltby’s funeral in Kent, he was listed as “tour expired” and was later posted to a conversion unit as an instructor. Howard was released from active service in March 1945 and returned to Australia to be with his wife Marjorie, who he had married in 1941 shortly before embarking for the war. After the war he worked in the Repatriation Department and then at the West Australian newspaper. He remained there until ill-health forced his early retirement in 1972. 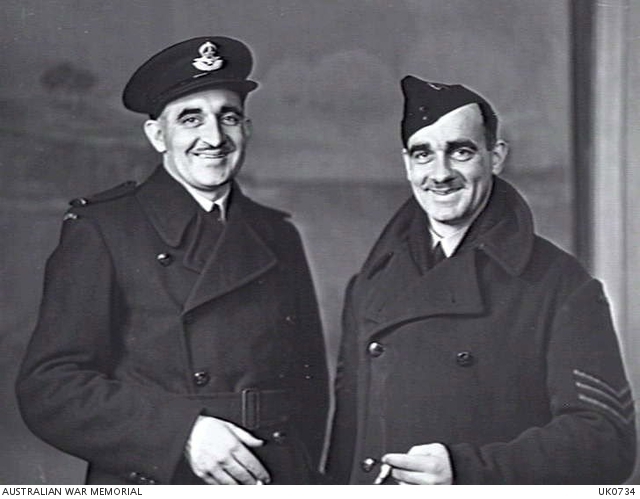 He was active in the RAAF Association but refused an MBE, stating he believed it was awarded to him on behalf of the RAAFA and he considered it insufficient recognition of the work of the Association. He was also involved in the Karrakatta Cemetery association, where he is now memorialised. Lance Howard founded the Air Force Memorial Estate in Bull Creek, near Perth. The estate provides comfortable housing for ex-servicemen, next to the largest aviation museum in Australia. He and his wife lived there until his death on 26 December 1989. Thanks to Colin Burgess for help with this article. Survived war. Died 26 December 1989. Amazing images! Love black & white. Also amazing how many of the younger generation have no idea there was a World war & that these young, incredibly brave people – in their teens -fought for what they all knew was a fight for their generations but future generations. I’m so happy you will tell this story, maybe others…:) in making the film.